The slip method for estimating motor load is recommended when only operating speed measurements are available. The synchronous speed of an induction motor depends on the frequency of the power supply and on the number of poles for which the motor is wound. The higher the frequency, the faster a motor runs. The more poles the motor has, the slower it runs. 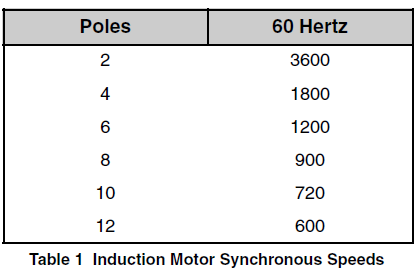 Table 1 indicates typical synchronous speeds. The actual speed of the motor is less than its synchronous speed with the difference between the synchronous and actual speed referred to as slip. 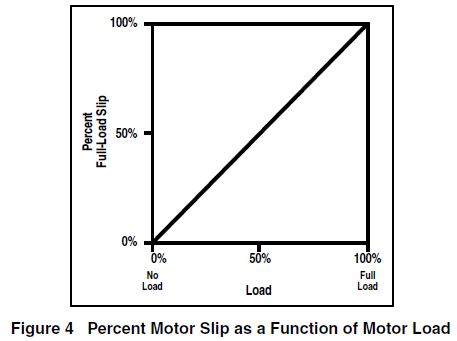 The amount of slip present is proportional to the load imposed upon the motor by the driven equipment (see Figure 4). For example, a motor running with a 50% load has a slip halfway between the full load and synchronous speeds. By using a tachometer to measure actual motor speed, it is possible to calculate motor loads. The safest, most convenient, and usually most accurate tachometer is a battery powered stroboscopic tachometer. Mechanical tachometers, plug-in tachometers, and tachometers which require stopping the motor to apply paint or reflective tape should be avoided. The motor load can be estimated with slip measurements as shown in Equation 5 and the following example. The speed/slip method of determining motor part-load is often favored due to its simplicity and safety advantages. Most motors are constructed such that the shaft is accessible to a tachometer or a strobe light. The accuracy of the slip method, however, is limited. The largest uncertainty relates to the 20% tolerance that NEMA allows manufacturers in their reporting of nameplate full-load speed. Given this broad tolerance, manufacturers generally round their reported full-load speed values to some multiple of 5 rpm. 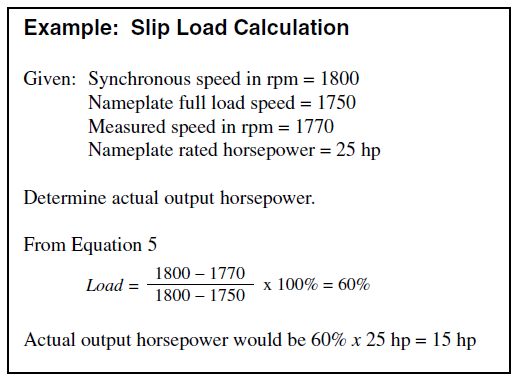 While 5 rpm is but a small percent of the full-load speed and may be thought of as insignificant, the slip method relies on the difference between full-load nameplate and synchronous speeds. Given a 40 rpm “correct” slip, a seemingly minor 5 rpm disparity causes a 12% change in calculated load. Slip also varies inversely with respect to the motor terminal voltage squared—and voltage is subject to a separate NEMA tolerance of ± 10% at the motor terminals. A voltage correction factor can, of course, be inserted into the slip load equation. The voltage compensated load can be calculated as shown in Equation 6. An advantage of using the current-based load estimation technique is that NEMA MG1-12.47 allows a tolerance of only 10% when reporting nameplate full-load current. In addition, motor terminal voltages only affect current to the first power, while slip varies with the square of the voltage. 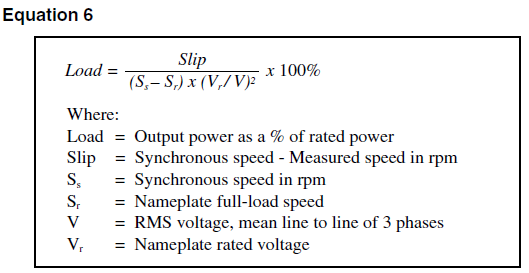 While the voltage-compensated slip method is attractive for its simplicity, its precision should not be overestimated. The slip method is generally not recommended for determining motor loads in the field.